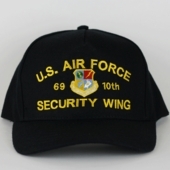 - Fits up to 7 3/4"
You can now create your own custom-embroidered U.S. Air Force Ball Cap. Your Unit, Rank, or Specialty Badge can be direct embroidered on the front of the cap with lettering above and below the center insignia. Limited lettering can be placed on the left and right side the insignia. All caps are premium quality and are MADE IN THE USA. All cap designs adhere to the same traditional Military designs that are still in use today. All of our custom hats begin with a MADE IN THE USA premium wool blend five-panel hat. The hats are one-size-fits-all with an adjustable cloth strap. The hats fit sizes up to 7 and 3/4. Lettering to the �right� and �left� of the center emblem is as you are looking at the hat. Text on the side panels of the hat is as-you-are wearing it, the left side panel is over the left ear and the right side panel is over the right ear. We do our best to ship every custom embroidery order within three weeks (15 business days) of the day it was ordered. We make all hats in the order they are received regardless of shipping method selected. Occasionally during the year and especially before holiday seasons such as Christmas, Father's Day, and Veterans Day, we receive more orders than we can fill within our typical three week time frame. If you need an item by a certain date, it is best to call us to see if we can fill the order by the date needed.